To see the entire list, go to shop.opmediagroup.ca and purchase the Summer 2009 issue. The bridge at WildPlay Element Parks Nanaimo stretches over the scenic Nanaimo River. If your knees turn to tapioca after signing up, WildPlay will issue a “chicken ticket” for another day. One weekend each February, the truly fearless can jump naked, with WildPlay donating the proceeds to charity. Bobbing for hours in frigid water with your body shrink-wrapped in neoprene may not sound like fun, but diehard West Coast surfers say the thrill of catching a wave erases all discomfort. There are surfable breaks along Vancouver Island’s west coast?including Sombrio Beach and Jordan River in the south, and remote Nootka Island and Hesquiat Peninsula farther north?and largely undiscovered areas along Haida Gwaii (the Queen Charlotte Islands). But Tofino, north of Pacific Rim National Park Reserve, is B.C.’s undisputed surf capital. Thousands of wannabe wave riders descend on the Clayoquot Sound community each year. The area is ideal for beginners because waves roll onto a forgiving sandy shoreline and are less concentrated than at rock or reef breaks. Extra elbowroom on the nice long beaches helps to maintain a friendly vibe in the water. And because there are several sites to choose from, it’s almost always possible to find a beach where wind and wave conditions are churning up a decent surf. 35: Estimated kilometres of surfable beach break in the Tofino area. 1.3: Average height, in metres, of summer waves off west-coast Vancouver Island’s Long Beach area. Winter waves average 2.8 metres high. 40: Speed, in kilometres per hour, that a surfer may reach while riding toward shore on a breaking wave. 10.4: Average temperature, in Celsius, of Pacific waters off Vancouver Island’s west coast. 5: Thickness, in millimetres, of typical wetsuits worn by B.C. surfers. 4,500: People, on average, who learn to surf each year with Surf Sister, one of a handful of Tofino surf schools. 73: Age of Surf Sister’s eldest clients to date: twin sisters who took a lesson together. Tofino Bus (866-986-3466; www.tofinobus.com) offers daily scheduled bus service from Victoria to Tofino and points between. The annual Rip Curl Stew surf contest near Tofino, early summer. As aboriginal tourism expands in British Columbia, First Nations groups are finding interactive new ways to share their traditions with the public, from guided nature tours to interpretive programs at their cultural centres. For a particularly lively immersion, take in a powwow. Drumming, dancing, singing, colourful regalia, and traditional foods such as bannock and salmon are common elements. Some powwows are competitive, with prizes for top performers, while others are more social. During intertribal dances, anyone can join in. Some annual gatherings: Yellow Wolf Intertribal Powwow (Brentwood Bay); Kamloopa (Kamloops); Bonaparte Traditional Powwow (Cache Creek); Traditional Father’s Day Powwow (Williams Lake). Summer sun worshippers of all ages clog Penticton’s seven-kilometre Okanagan River Channel with inner tubes, dinghies, air mattresses, and colourful inflatable pool toys. On a hot day, some 4,000 people may drift the waterway that runs along the city’s west side from Okanagan Lake southward to Skaha Lake. The full trip takes three to five hours, depending on winds and water levels, though many choose to exit at Green Mountain Road, the halfway point. A nearby gas station there sells cool treats and sunscreen. Coyote Cruises provides rentals and an affordable shuttle service from Green Mountain Road back to the launch point. Mountain bikers refer to it as “flow,” the sensation that comes from pedalling your heart out. “Just being out in the wilderness on a bicycle is a whole exhilarating experience,” says Victoria’s James Brown, of the International Mountain Bicycling Association of Canada. B.C. is the place to pedal for the peaks, with trails galore and diverse topography from the Rockies to the Purcells to the Coast Mountains. Must-do routes include the Seven Summits Trail in Rossland. “It’s an all-day adventure in a spectacular setting,” says Stewart Spooner of Rossland, who helped build the route, which stretches more than 30 kilometres. The IMBA lists it among its “epic” North American rides, along with the roughly 16-kilometre Eagle Ridge Expedition on Vancouver’s North Shore, and Whistler’s Comfortably Numb trail, about 25 kilometres. Info: (www.imba.com/canada; www.rosslandtrails.ca; www.whistlerbike.com; www.trailpeak.com). As I zip up my survival suit, I know this will be no ordinary boat ride. But then, Bute Inlet is no ordinary destination. The deep fiord, which carves 75 kilometres into the Coast Mountains north of the Strait of Georgia, is one of the province’s wildest, most remote attractions. We begin our journey from Lund, the terminus of Highway 101, up the Sunshine Coast. As we pass Desolation Sound Marine Provincial Park, kayakers and recreational boaters wave as they bob in the sheltered waters. But beyond Stuart Island, at the opening to Bute Inlet, their numbers dwindle. We pass a seal and her pups on a floating log, then we are alone. Only the boat’s wake stirs the teal blue waterway. Waterfalls streak the steep granite cliffs that flank the inlet. There’s a chill in the air now, and the light bow spray on my face makes me shiver. A lavender sky warns of rain as an eagle rides an updraft then disappears into the mist. At the head of Bute Inlet, where the Homathko and Southgate rivers meet, mountains rise from the ocean’s edge like giants from their beds. We turn our eyes upward for one final reward: 4,016-metre Mount Waddington—the highest peak entirely within B.C., about 50 kilometres inland—and the enormous Homathko Icefield. Rob Wood, who used to guide visitors up the Bute and is among the elite climbers who have reached Waddington’s summit, chose to make his home at the inlet’s mouth. There’s something magical about the glow that bathes a mountain peak at dawn or dusk. Landscape photographers pursue this luminous light as if it were a rare, white spirit bear. “We sleep in the middle of the day,” says Jeremy Jackson, who captured this image of Lady Peak on Cheam Ridge, northeast of Chilliwack, 10 minutes before sunset. In the mountains, patience is rewarded. It was foggy and snowing the day Jackson snowshoed into the area, and Lady Peak wasn’t showing her face. Then a crack opened in the clouds—just for a minute—and light shone through the snow and ice crystals in the air. Jackson fired off some shots before the peak disappeared from sight again. More than 90 million years ago, when dinosaurs still inhabited British Columbia, lumbering, cow-sized, vegetarian ankylosaurs and fleet-footed, bipedal, carnivorous theropods left their marks on today’s Tumbler Ridge area. Visitors to the northern community can walk the fossilized footsteps of these reptilian ancestors at trackways along the Wolverine River and Flatbed Creek. The Peace Region Palaeontology Research Centre offers guided summer tours, including a night walk at the Wolverine site; low-cast lantern light dramatically enhances the shallow impressions. Researchers have verified several dinosaur finds in north-central B.C., including one near Hudson’s Hope, and others in the Fraser Canyon and Elk River valley. With fresh Pacific breezes and plenty of elbowroom, Wickaninnish Beach on Vancouver Island’s west coast—in the Long Beach unit of Pacific Rim National Park Reserve—makes an ideal spot to hoist a kite. Just don’t plan to run the full 22-kilometre length of Long Beach’s famous sandy shore. Kite flying, to our surprise, is restricted in this area because of Tofino Airport to the north. Stick to Wickaninnish, though, and you’ll be fine. When the wind disappears, build sandcastles, surf, ride a horse, bike, paddle, watch for whales and sea lions, or explore any of nine rainforest trails in the Long Beach unit. At low tide, scan the rocky shores for giant green anemones, purple sea urchins, and tidepool sculpin—tiny fish that change colour to match their surroundings. Pacific Rim National Park Reserve, between Ucluelet and Tofino, is about a five-hour drive from Victoria. With names like ambrosia, sunrise, jonagold, and aurora golden gala, British Columbia’s apples sound as sumptuous as they taste. Commercial growers produce an estimated 20 to 25 varieties of this popular tree fruit, but hundreds of other types ripen on hobby farms and backyard branches. Saltspring Islanders alone claim to grow 350 different kinds of organic apples on their southern Gulf Island. 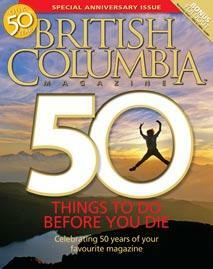 On average, each British Columbian eats 75 to 100 B.C. apples a year, and most of these come from the sunny Okanagan and Similkameen valleys. The warm, dry summers and cooler falls there beget apples with an attractive finish and crisp, juicy, flavourful flesh. October 4, 2009, and at UBC Botanical Garden in Vancouver, October 17 and 18, 2009. Catching sight of the Stawamus Chief lording over Highway 99 is enough to stop your breath in your chest—so imagine the view from the top. These massive granite cliffs offer hundreds of world-class rock-climbing routes. Aided by a guide, newer climbers can find their feet on the easier routes, while experienced climbers tackle complex cracks in the Grand Wall’s sheer rock face. “The Grand Wall as a rock climb is completely unparalleled,” says Kevin McLane, author of The Climbers Guide to Squamish (Elaho Press, 2005). Hiking is a less daring—though still strenuous—way to see the three summits, which rise more than 600, 650, and 700 metres in succession. Feast on the panorama of Howe Sound and the Squamish Valley, and watch soaring peregrine falcons. Stawamus Chief Provincial Park is north of Vancouver on Hwy 99, just outside Squamish. British Columbia’s wild spaces and rich biodiversity make it the unsurpassed outdoor-adventure destination it is. Help to keep it that way by joining the brigades of volunteers working to restore sensitive ecosystems and support threatened wildlife. Some opportunities require specialized skills and long-term commitment; others require as little as a few hours and a willingness to work hard. Remove trash from B.C. beaches during the TD Great Canadian Shoreline Cleanup (www.vanaqua.org/cleanup/home.php), September 19 to 27, 2009. Take a “conservation holiday” with The Land Conservancy of B.C. (www1.conservancy.bc.ca/conservationholidays). Build fences, install nest boxes, harvest organic produce: opportunities vary around the province. Fees apply. Monitor grey whales off Vancouver Island’s west coast on weeklong expeditions with Earthwatch Institute scientists (www.earthwatch.org/exped/megill_canada.html). Participants help to catalogue and analyze whale sightings and track the greys’ prey to aid research into how climate change may be affecting the species. Trips run in July, August, and September 2009. Minimum fee: $2,250. Sort frozen fish for a marine mammal’s dinner, don a scuba suit to clean aquarium habitats, or crunch data from wild whale sightings: the Vancouver Aquarium (www.vanaqua.org/volunteer) needs assistance with these and other tasks. Help the Burrowing Owl Conservation Society of B.C. (www.burrowingowlbc.org) re-establish a permanent wild population of these charismatic little birds in the Nicola Valley. Volunteers may help to prepare release sites, care for birds at breeding centres, or assist with field monitoring. Pull invasive plants, monitor bird boxes, or help to maintain wetland trails in the 70-square-kilometre Creston Valley Wildlife Management Area (www.crestonwildlife.ca). Tend to injured animals at the Wildlife Rescue Association of B.C.’s care facility in Burnaby (www.wildliferescue.ca/position.shtml); some 3,000 hurt or orphaned creatures come through each year. There is a Greek proverb that says, “A civilization flourishes when people plant trees under which they will never sit.” Volunteer today.